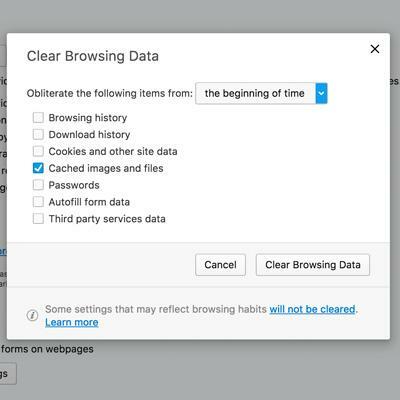 Each browser handles clearing the cache data differently. As in Windows each browser on Apple devices has it's own place to store the cache data. 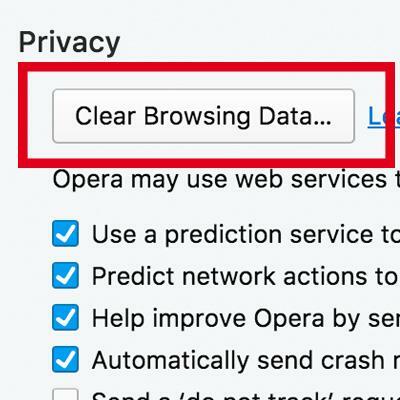 Here we show you, step by step, how to delete the cached files in the Safari, Google Chrome, Mozilla Firefox and Opera browsers. 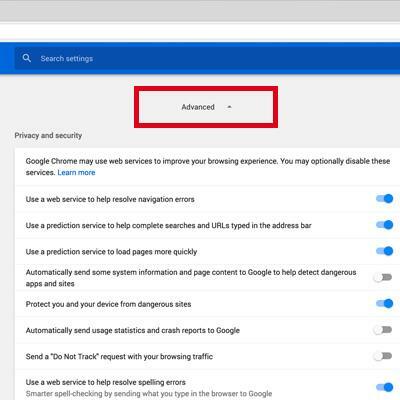 To delete the browser cache in your Google Chrome browser on a Mac please follow one of these instructions. Press the keys [shift] + [cmd] + [del]. A new browser tab with a popup window opens. In the drop-down menu at the top, you can select which time range you want to delete the cache. You can select from the following options: past hour, past day, past week, last 4 weeks, the beginning of time. If you want to delete all the cache data select "the beginning of time". Enable the checkbox "Cached images and files". Click on the button "Clear Browsing data" and reload the website. 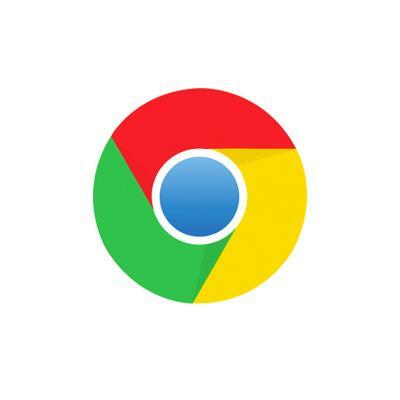 Click on "Chrome" in the main menu. The popup window from the first instruction opens. Follow these instructions from step 2 onwards. First, click on the three dots in the upper right corner of the browser window next to your URI bar. 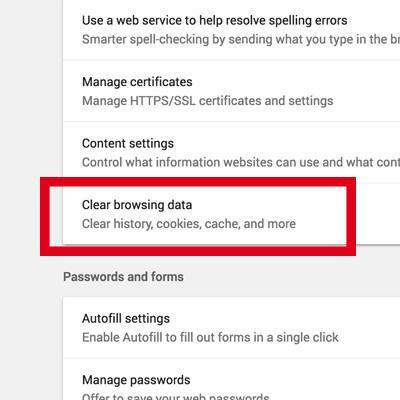 You can access the "Clear Browsing Data..." from the menu item "More Tools" or from the "Settings". 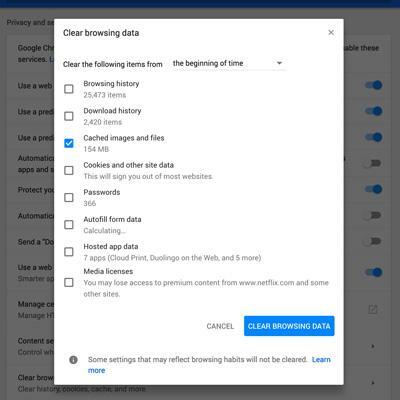 If you select "Clear Browsing Data..." the popup from the first description opens. Proceed as described in the first instruction from step 2. 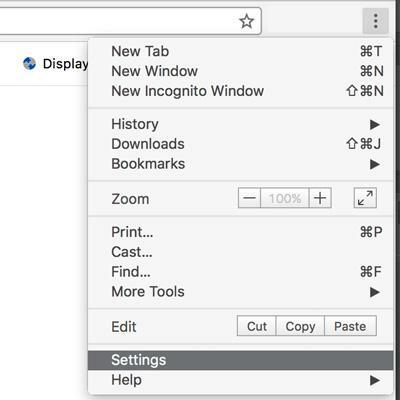 If you select "Settings", the browser settings open in a new window. Scroll to the bottom and click on the link "Show advanced settings". Depending on your screen size you might have to scroll down to see the link. Click on the "Clear Browsing Data..." Button. The popup window from the first instruction opens. Follow those instructions from step 2 onwards. 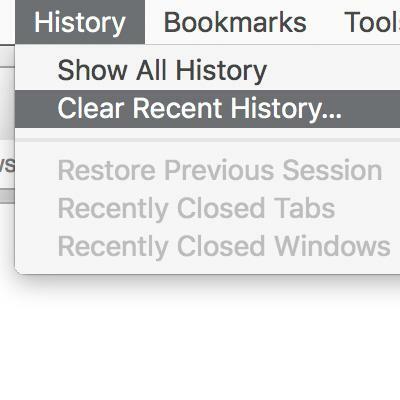 In the main menu of the browser select "History" and below that the submenu-item "Clear Recent History..."
A popup opens. In the drop-down menu, you can define the time range you want to delete the cache. You have the following options: last hour, last two hours, last four hours, today or Everything. To delete all cache data, select "Everything" from the drop-down menu. Afterwards, click on the arrow next to "Details" to show the different possibilities for which data should be deleted. If you want to delete only the cache, then check only the checkbox next to "Cache". With a click on the button "Clear now" you delete the cache. 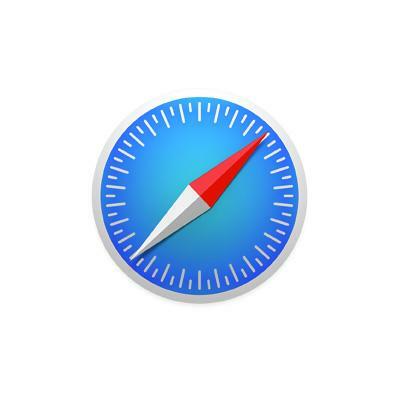 If you want to delete the browser cache in Safari, you can do that quickly with a keyboard shortcut or through the developer menu. The fastest way to clear your cache is to use following shortcut: [CMD] + [ALT] + [E]. Select the first item "Safari" in the main menu and from the drop-down the item "Preferences..."
A popup opens. Click on the tab "Advanced". 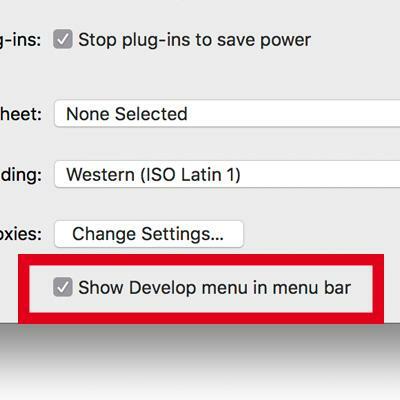 Check the option "Show Develop menu in menu bar" at the bottom. Now you should see a new menu item in the main menu named "Develop". 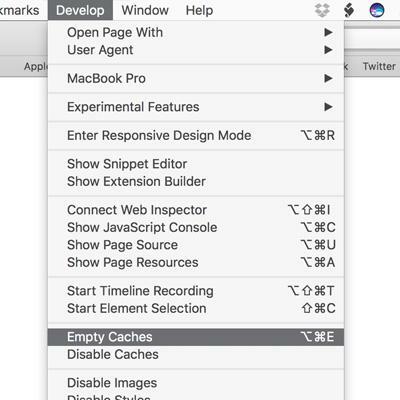 If you click on the menu item "Develop" you can select "Empty Caches" from the submenu items. 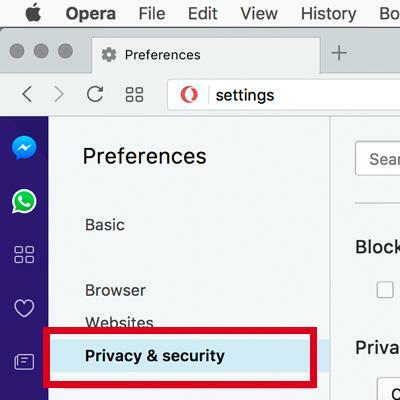 In the Opera browser, you can delete the cache quite easily. Follow this step by step guide to find the options. The settings open in the browser window within a popup window. In the drop-down menu at the top of the popup, you can select which time range you want to delete the cache for. You can select from the following options: past hour, past day, past week, last 4 weeks, the beginning of time. If you want to delete all the cache data select "the beginning of time". 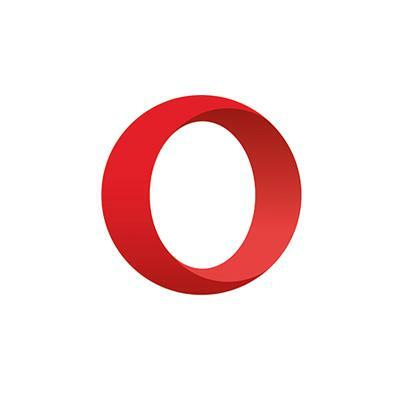 Click on "Opera" in the main menu. 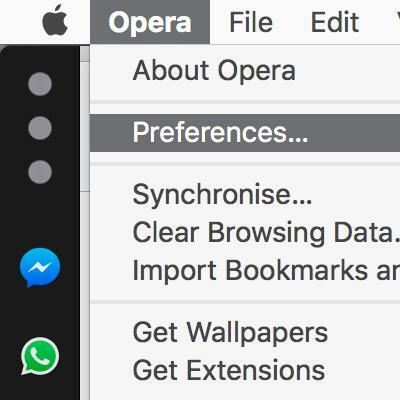 Click in the mainmenu at "Opera" and then on "Preferences"
The Preferences open in a new window. Select the item "Privacy and Security". You'll find the title "Privacy" and below it the button "Clear Browsing Data...". After clicking the popup window from the first instruction opens. Follow those instructions from step 2 onwards.